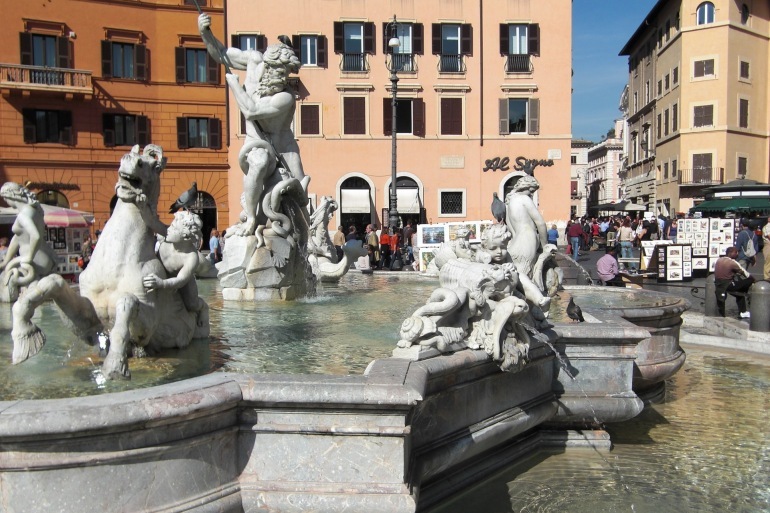 Visit classy Piazza Navona and the remarkably preserved, 2,000-year-old Pantheon. See Michelangelo's Moses at St. Peter-in-Chains Church. Take a panoramic bus tour. Begin guided tour of sheer beauty in the Borghese Gallery. Rome serves up Europe's most intoxicating brew of dazzling art, earth-shaking history and city life with style. On this tour, your guide will resurrect the grandeur of Ancient Rome's Colosseum, Forum, Pantheon and nearby Ostia Antica. From the Renaissance and Baroque eras, you'll marvel at St. Peter's Basilica, the Vatican Museum, Sistine Chapel, and Borghese Gallery. You'll also enjoy today's Rome, with a cooking demonstration, neighborhood walking tours, memorable restaurants, and time to explore on your own. Join us for the Best of Rome in 7 Days! Let's get together at our hotel for a meeting at 3 p.m. this afternoon. After an orientation walk through our neighborhood, we'll get oriented to Rome's efficient metro system and then enjoy an "Am-I-really-here?" dolce vita stroll through the heart of Rome, soaking up the city's evening ambience at the classy Piazza Navona and the remarkably preserved, 2,000-year-old Pantheon. Our day will end with a chance to get acquainted during a "Welcome to Rome" dinner together. Walking: moderate. After breakfast we'll ride the metro back in time to Ancient Rome. We'll arrive at multilayered San Clemente — a 12th-century church sitting atop a 4th-century basilica and a previous Roman temple. Then we'll tour and hear vivid tales of the larger-than-life Colosseum. After a break for lunch, we'll tour Ancient Rome's birthplace: the Forum. You'll have the rest of the afternoon and evening free to wander through the nearby Palatine ruins, see Michelangelo's Moses at St. Peter-in-Chains Church or climb to the top of the Victor Emmanuel Monument to enjoy the city view (don't forget to savor a foamy cappuccino in between). Walking: strenuous. This morning we'll take a more intimate look at Rome, with a Vespa-dodging walking tour through our guide's favorite neighborhood. Then we'll eat our way through Rome's Trastevere neighborhood, learning about the tradition of Italian cuisine from the generations of families producing these tasty Roman specialties. Treats will include (but are not limited to) porchetta, pizza, and parmigiano. Afterward you have a free evening to make your own neighborhood discoveries. Walking: moderate. Today we'll focus on Renaissance Rome. We'll meet our local expert on the other side of the Tiber River and take a guided tour of the sprawling Vatican Museums, where you'll see an endless collection of treasures as you make your way to one of the world's most famous works of art: Michelangelo's Sistine Chapel. We'll continue on to the greatest church in Christendom, the awe-inspiring St. Peter's Basilica. Your afternoon is free to wander through this immense church, climb the dome if you're feeling energetic, and explore more of the Eternal City on your own. No bus. Walking: strenuous. Today we'll venture outside the city, touring the ruins of Rome's first colony, Ostia Antica, the ancient seaport which connected Rome to its ever-expanding Mediterranean empire. Unlike Rome's politically oriented Forum, our walk through Ostia gives us a chance to envision the daily lives of merchants and craftsmen, and appreciate beautifully preserved mosaics. As we head back to Rome, we'll take a panoramic bus tour as we continue to peel away the jumbled layers of this fascinating city, learning about Rome as Italy's political capital, the capital of Catholicism, and the center of the ancient world. On the way, we'll continue down the ancient "Queen of Roads," the Appian Way, stopping to tour the eerie Catacombs of San Sebastiano. Arriving back in our Rome neighborhood, you'll be free for dinner on your own. Bus: 3 hrs. Walking: moderate. We'll begin with a guided tour of sheer beauty in the Borghese Gallery. Bernini's most graceful and lifelike sculptures reside here — his athletic David and delicate Apollo and Daphne — as well as masterpieces by Canova, Caravaggio, Titian, and Raphael. Your afternoon is free to relax in the surrounding park, ramble through more of Rome, or do some last-minute shopping. Tonight we'll have one last dinner together to share travel memories and toast new friends. Salute! Walking: moderate. Breakfast is provided, but there are no group activities today. We'll say our final farewells and head for home — or further adventures in Italia. Arrivederci, Roma! Cancellations and refunds: Your tour deposit is 100% refundable for 30 days from the date it is received, unless noted otherwise below. After 30 days your deposit becomes nonrefundable, and will be forfeited should you decide to cancel your reservation. Deposits made 60–90 days before a tour departs become nonrefundable on the final payment due date. If you book a tour less than 60 days before its departure date, the entire tour cost becomes non-refundable after 7 days.